It has been a bit of a mixed few weeks, and although there have been a few challenging events, I am happy to be able to end this blog entry with some positive and uplifting activities. We will get there in a moment! 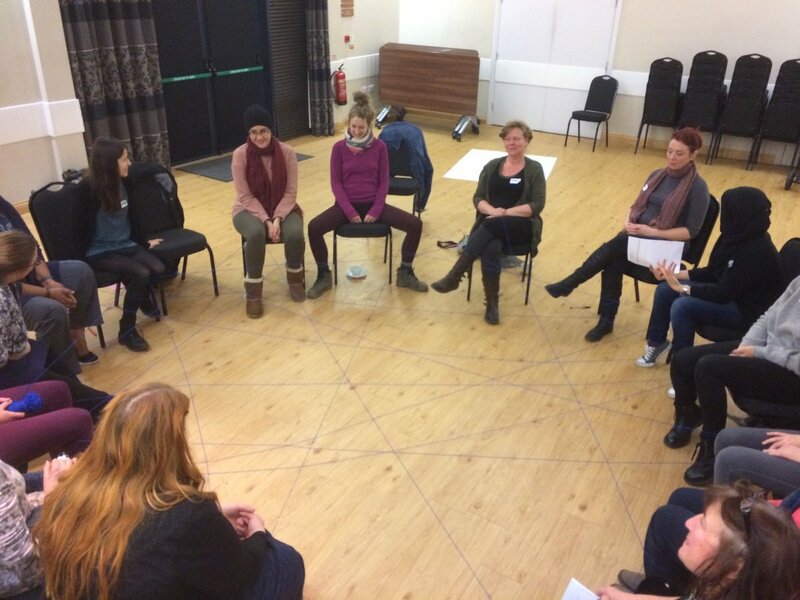 In our final Women for Peace session, we threw a ball around the circle and remembered all the activities we have done throughout the ten weeks. Then we were given post-it notes of the activities to lay out on the floor in the order that we completed them. Following this, we spent time collaging, colouring or sculpting things whilst reflecting on what we will be taking away with us from the course. For me, the most important lesson learned is to speak out at future events and make my access needs loud and clear from the beginning rather than sitting through what proved to be an inaccessible setting for weeks. Then we were asked the same questions from session 1, including how confident we feel in challenging someone with extremist views, and how much we feel we can increase cohesion in our community. For this, we were invited to stand in a continuum line, which for me personally was disabling as I was not able to move around like the others and share my opinions with them. It felt like my comments from the previous week hadn’t been taken on board. Finally, we worked as a group to think about what we might like to do next. Individually, we had to write a letter to ourselves to be sent off to us in six months’ time, not totally accessible exercise for someone with a visual impairment (both in terms of writing and reading it)! I was relieved that I had stuck it out for ten weeks, and this was the last one, given my growing feelings of exclusion. However, to my delight, soon after the course one of the facilitators of Women for Peace arranged to meet me to go through the course. As we reviewed each of the activities in turn, I informed her how it was or wasn’t inclusive for me and how it could be made inclusive. It was good to discuss my concerns and hopefully make the course more accessible for the future disabled participants, but I strongly feel that our expertise should be valued, and we – as disabled people – should be paid for sharing our knowledge. Doing anything other than this feels like the organisations, who have excluded us in the first place, are using our marginalisation to their advantage and this does not feel fair. As well as the meeting with Women for Peace, I attended the Neurological Users and Carers Forum (NUCF) meeting, at the Leeds Teaching Hospital. We used to have monthly meetings but due to the ‘cuts’, our meetings are now reduced to quarterly ones. The group used to have a consultative position and inform service users’ views on the service received, however these days, even in these quarterly meetings, it feels that the staff running the group would much rather if we didn’t turn up and that it is a hassle for them to be present in the meetings. Plus, as a relatively new member of the forum, the staff are still not used to having me in the group, and often refer to handouts or screen and say: ‘as you can see’. I had to stop them and ask them to read out the content of the screen once or twice. So, all in all, like the others, I don’t feel valued but am keen to continue attending the group, because I feel it is through participating in similar groups that we can help to improve the service. In contrast to the NUCF meeting, in the evening of the same day, I went to the Community Committee meeting held in my Leeds council ward. I really enjoy going to these, where the councillors address the concerns of community members. I feel inspired every time I attend these meetings and always want to be involved more in my local community. Another positive meeting was held for employers of personal assistants. A few of us meet up every so often in the Centre for Integrated Living to discuss any issues and PA-related experiences with each other and with a member of staff. I explained how I did not find the First Aid course inclusive from a disabled person’s perspective. I was pleased to present the case for needing a First Aid course for the employers as well as Mental Health First Aid course for both employers and employees. The group agreed with me and the CIL is going to look for trainers for delivering these courses. It’s good to have meetings and gatherings that uplift me. 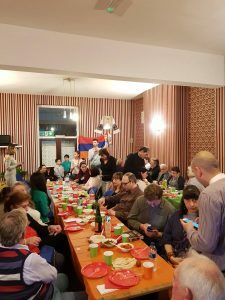 We attended an Armenian Easter-Party for the Armenian community in Leeds and surrounding areas. It was so lovely to see some old friends and meet new ones, a real taste of home! For the three hours that we were there, I felt part of a loving, supportive and accepting community and it was beautiful. Culturally, I’ve seen a few films lately too. We went to see Sweet Country, an Australian western, set after the First World War, about an aboriginal man accused of murder. I found it thought provoking and there were some striking and disturbing parallels with today’s society, as well as it not having a typical Hollywood ending. A few of us also went to see Lady Bird. None of us had read about the film and were disappointed to find out it was a film about a teenager. I didn’t really enjoy the film at all, it’s not my kind of thing. I could see why there was an Oscar win for supporting actress, but I could have waited to see it on Netflix, rather than having spent money to see it! Speaking of Netflix, I have been watching programs on energy healing, positive thinking and its links to happiness as well as a series on the nature of God, miracles and death in different religions. These documentaries have been interesting, and I feel so privileged and grateful to be on the path of working with the healing power of energies. In our healer Student Development group, we were taught about the basics of mindfulness and practised some guided meditations. The techniques the workshop leader guided us through managed to completely calm and ground me and leave me in the present. It was serene. Continuing that theme, today we went to the Left Bank Centre for an afternoon of reflection. The meditation was based around an exhibition on the life cycle that was on for the Easter week in the centre, so we meditated on poems and pieces of literature about birth, youth, maturity and dying. Having had friends and acquaintances pass away over the last few months, this meditation felt timely for me. Going through the exhibition and the reflective space, it was good to reaffirm that death and birth are only a breath away and dying leads to rebirth and new possibilities – just as letting go of challenges and discrimination I faced earlier on lead me to more reflective and tranquil time, opening to new opportunities. I have had a super busy two weeks and have not had time to keep up with blogging. I attended a working group with various stakeholders representing the taxi licensing for Amber Taxis, the main taxi firm in Leeds, to discuss different issues concerning the passengers. 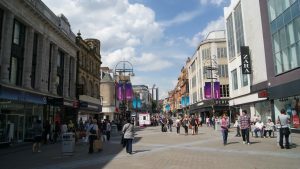 The discussion revolved around topics including taxi pick up points, cross-bordering (drivers from Bradford or Sheffield for example, working in Leeds) and training for the drivers. The members were interested to hear from the passenger group. There were only two equality hub representatives and we were both from the disability hub. The questions asked were mainly about disability awareness training, we were reassured that the drivers are due to receive a new set of trainings, the content of which was going to be discussed in the next working group. Sadly neither of us was able to attend this so it remains to be seen in the third meeting whether or not the programme proposed includes effective and detailed disability training. What was clear though was the inaccessibility of the meeting paperwork; we were handed out a large hard copy folder with lots of printed files. I mentioned that this format was not accessible for me and asked them to send me an electronic version of the files, sharing with them my contact details. Almost three weeks on this email has not arrived yet, even after another request send to the chair. I am not going to attend the third meeting if the paperwork is not sent to me electronically in advance of the meeting, because I feel I have been denied equal access to the paperwork and for that reason, I see little point in my participation in the meeting. The first meeting itself was intimidating enough; there were about 20 people present including some councillors and council officers. The meeting was dominated by the male members and women were generally not very vocal. It was challenging to speak out but I tried to talk about the difficulties I have faced when using taxies as clearly as I could. I am going to start documenting all the difficulties I face in future blogs, so we’ll see if anything changes! In the last two weeks, the Women for Peace course has been very interesting and informative. We explored ‘them’ and ‘us’ thinking, and how this narrative can be used by extremist groups to divide people, even to trigger violence. To examine this, we looked at the 22 Factors of Vulnerability, covering engagement such as feelings of grievance or injustice, a desire for status, being at a transitional time of life; intent such as over-identification and ‘them and us’ thinking; and capability, such as knowledge and access to networks and resources. These are some of the factors that can be used to assess whether someone might be on the path to terrorism (although this in itself is by no means evidence to criminalise anyone). 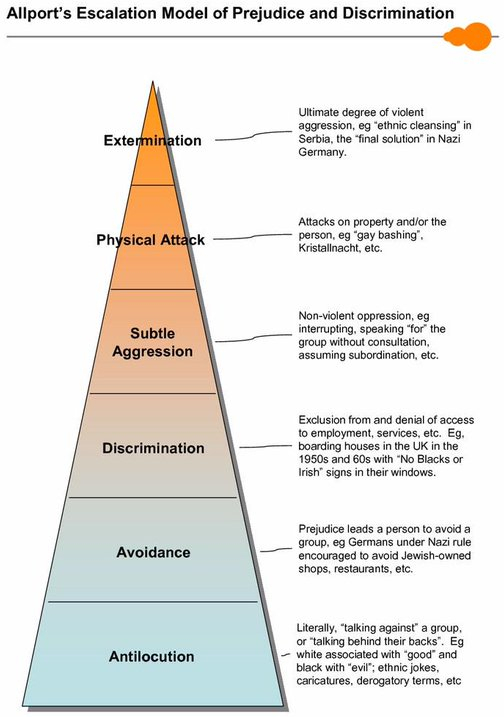 This lead us to the exploration of Gordon Allport’s Nature of Prejudice Model, starting with anti-locution (negative words and comments about a group), then avoidance, then active discrimination against them (not employing people from that group), before physical violence and then ultimately extermination. This model brought home for me far right disablist groups, who spread bigotry against disabled people and promote disability hate crime or even extermination. The ‘us’ and ‘them’ way of thinking is relevant to disabled people’s life, where we are marginalised, excluded and not fully accommodated even in well meaning causes. Sadly the Women for Peace group does not seem to be interested in focusing on disabled people’s oppression, despite my attempts to bring up the topic wherever I can. We then discussed the linear route suggested by an Iranian sociologist Moghaddam – ‘Staircase to Terrorism’ – as the path someone might take to carrying out an act of terror. 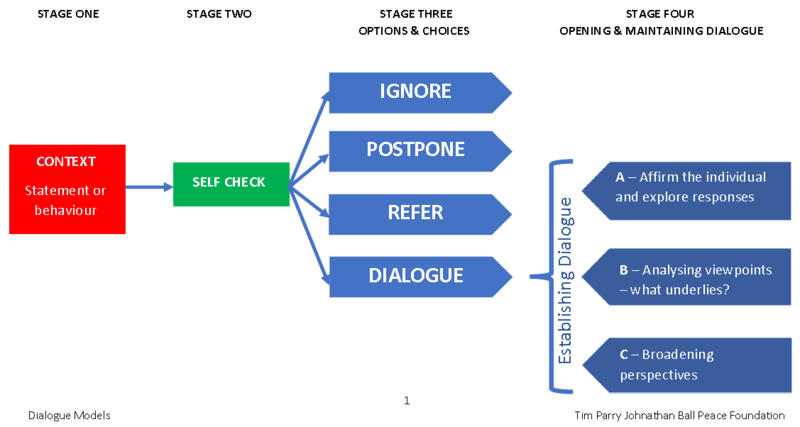 The model highlights the implications of a single story narrative, and how a person can isolate themselves into becoming trapped in that mindset. I personally felt Moghaddam’s model was too linear and somewhat simplistic, not necessarily allowing room for the influence and interaction of multiple variables in an individual’s life. We have also been watching ‘My Former Life’ over the last two weeks, and heard about the childhood experiences of four former extremists, ranging from psychological abuse to being bullied, how they each ended up joining an extremist group and what their turning points from those groups were. In small groups we then looked at each of the characters, and considered how life is for them now and how much they have recovered. I felt the turning point for all four characters was the recognition of human connectivity and the sense of our unity as human beings through the revaluation of their values, whether it was because they were overcome by a major sense of guilt or it was because they were touched by other’s kindness, words and actions. Outside of the Women for Peace course, I attended a First Aid at Work course at the Centre for Integrated Living. Considering I have a team of six PAs, I felt it was important to know what to do should an emergency situation arise. The course was extremely informative and I learned a lot but it was very intense. In terms of accessibility, I was confronted with a number of challenges. Lots of example scenarios were very visual with little audio description; even the course handout was not fully accessible. The one to one attention that you would expect to be given to a disabled person attending a First Aid course to demonstrate the life support techniques was lacking. Despite all these barriers, I spent a full weekend revising for the exam, only to arrive on the Monday morning and to be told by the trainer that the head of the region had decided to award me only an attendance certificate instead of certificate of achievement, and that I did not need to take the exam. While at first the internalised oppression kicked in and I said ‘I understand as I am not an ideal candidate for the first aid’, I immediately knew this was discriminatory, so I started the bargaining process. I challenged the trainer on taking at least the theory test, and then expressing my desire to take the practical one as well. He referred the request to the assessor, who was due to arrive later in the day, and while he did that, I rang David, who is on annual leave this week. I was demotivated, but determined to take the exam and David was happy to scribe the exam paper for me and also be my body buddy for the practical exam. I dictated my answers to David and once the assessor arrived I did the practical test. To my delight, the assessor was unsure as to why I should not receive the full certificate; she thought I performed well in both exams. I personally felt I could have done much better if I was not made to feel excluded from the examination process in the morning and thus discouraged. Nevertheless, I am pleased for challenging the trainer and showing that I am capable of partaking in the exam, It remains to be seen if I receive the full certificate or not, but that’s not the point. I’m also going to raise this with CIL as part of the feedback. 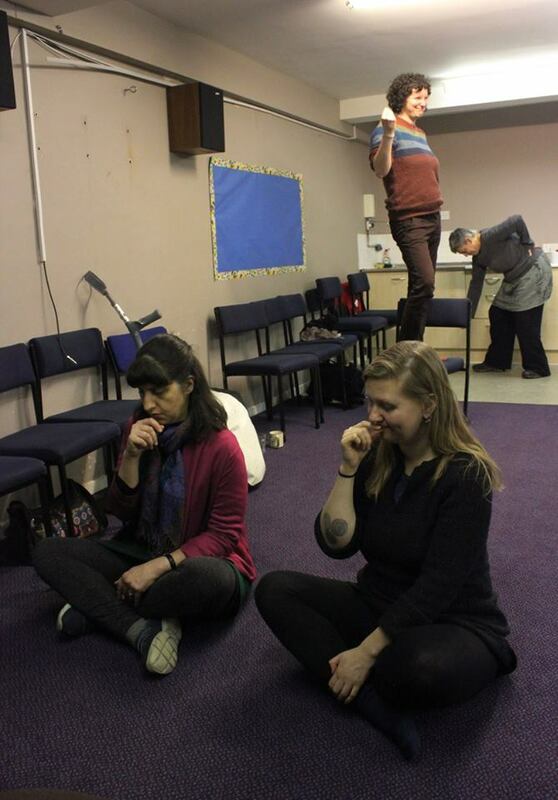 If all that wasn’t enough, I also participated in a weekend long workshop on the Theatre of the Oppressed (TotO) organised by Reboot the Roots and Leeds Tidal. This school of theatre-making, using a methodology underpinned by an ethos of empowerment, offers theatre as a tool for liberation to people in all stages of life in all parts of the world. It is a means of using theatre as a way of better understanding ourselves and how we fit into the worlds around us, and most importantly, how we might consequently change those worlds. It is a concrete embodiment of the arts as a real instrument for social and political change. The Theatre of the Oppressed is the remarkable invention of Augusto Boal, the Brazilian theatre-maker, theorist and activist. We started the weekend with some specific exercises like Clay-modelling. We arranged ourselves in two lines of sculptures and statues facing each other. In the first round the sculptors were asked to mould their statues to objects while in the second round the sculptors were invited to mould an emotion. Then we were divided into small groups and given the task of representing a social issue in a statue form. 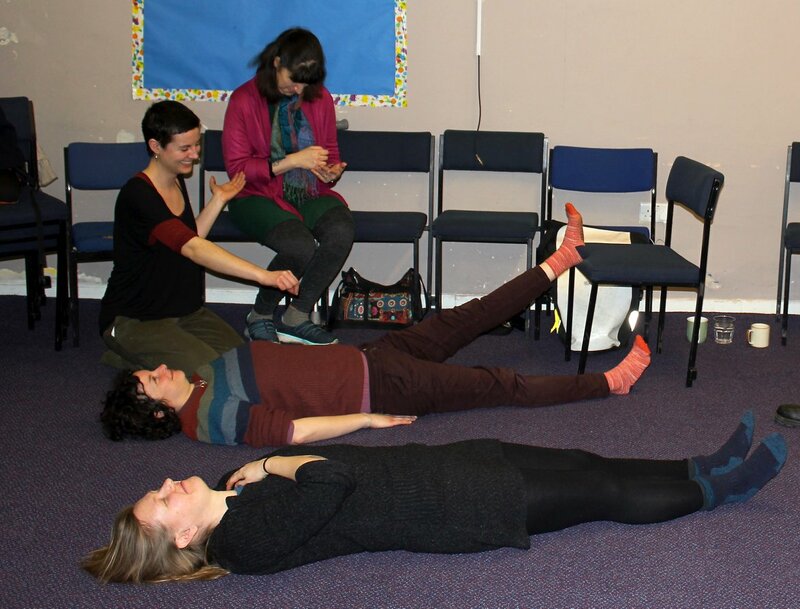 Next we were told the name of a specific location in our teams and asked to display the place by using our bodies or body parts without talking to each other. Through creative techniques such as Image Theatre, Rainbow of Desires and Forum Theatre, we explored various oppressions. Forum theatre is one tool of the Theatre of the Oppressed for enabling people to change their world. The objective of forum theatre is to transform passive spectators into active spect-actors through the presentation of a piece of theatre where a protagonist experiences an oppression – a situation where they fail to achieve what they want, or are prevented from doing so by the antagonists. We used the forum theatre for the most of the weekend. On the Saturday I volunteered to lead a group of four to perform out a disability discrimination scene. Firstly, we presented an anti-model: a short play where I as the protagonist tried and failed to break my oppression of being ignored and excluded, sitting on my own in a group with two chairs empty either side of me, and feeling lonely. The others were sitting together and talking patronisingly about the protagonist saying things like ‘poor thing, how does she manage’. Next, the Joker (the TotO facilitator) explained that the model will be replayed, but this time whenever the audience sees a moment the antagonists can act differently, they can shout out ‘stop!’ and once the audience member shouts stop, they are invited onstage to replace one of the antagonists and improvise their solution to the problem. The audience tried to replace different antagonists for a few rounds but none of their attempts to include the protagonist came across as natural. In the last round, I was asked to adopt an alternative approach as the protagonist, which I did. Instead of just sitting there, I made the proactive effort to be involved, such as saying hello and inviting the others in the group to come sit next to me. While the outcome was desirable and created a more inclusive environment, I felt it should not be down to me alone to put in all of the effort of making people feel comfortable, as this is something that I do most of the time. This in its way reinforces the oppression by not addressing the root of the problem and everyone agreed. Although the participants were clued-up and informed people, they all found the exercise helpful particularly as it was a direct reflection of a disabled person’s experiences, something that they were not so exposed to. Even though in the end we did not find an ideal solution and we did not break the oppression, I felt empowered having shared my daily disabling experiences with a receptive audience, who were willing to learn and look for solutions. I feel TotO has a great potential of raising awareness of social justice issues and involving the community; I would love to build on what I learned last weekend and do similar scenes reflecting the oppression of disabled people as a means of education. I remain hopeful that some opportunities will be opened in this direction. It has been busy but steady in the healing centre for the last two Fridays and we have welcomed some old and new visitors to our new location, however throughout these busy days, I experienced a terrible migraine. This made me very sick but I was determined to stick it out and stay for all the events as it is important for me to participate in community activities, where I have chance to be ‘me’, meet new people and learn. I’m having a slight rest this week, readying myself for the work ahead, and I’m off up to the Left Bank Centre in Leeds this afternoon for some community bonding over cake and tea! Hopefully it’s vegan! At last week’s Women for Peace course, we explored the multiple story narrative. We started by sitting in four groups of four, all of us writing a fact about ourselves. Then we had to guess which fact belonged to which person. When we had more information about another person, it was easier to guess the fact about them, while others were not as easy. I chose to disclose some information about my spirit animal to show a different narrative to my identity. I was not sure how the group would react to my fact or if indeed they would take it to be a fact. Everyone was very matter of fact about it! I wish I had been able to talk about more facts about my life! I am sure there will be more opportunities for this in the coming weeks. Then we used a ball of wool to demonstrate how connected we all are, this was done through learning more about each other’s multiple narratives and connecting our feet together. Following this, we created a character called Anna and we gave her many different identities/labels. The idea was to show how a person can have multiple, yet contradictory facets to them, which interact together and shape who they are. This full information, therefore informs their multiple narratives. I did not quite enjoy this exercise as it was less structured and the aims of the activity were not clear from the outset. It was interesting that no one in the group thought about the ‘disabled’ label for Anna (in terms of physical or sensory impairments), and when I suggested Anna having mobility impairment, the group then considered different access barriers and became aware of a new set of dynamics and inequalities. Returning to academia, I worked on the second draft for the ‘current issue’ of Disability and Society journal about my experiences of my recent academic trip to Armenia. While I wanted to write about the disadvantages I faced as an independent researcher during this trip, the editor was more interested in the parallels and contrasts between the Armenian and British education system and recommended some changes accordingly. Since submitting the first draft I have come across another platform where I can write more fully about my experiences of being an independent academic. Therefore, I decided to dedicate the entire short article for the ‘current issue’ to the exploration of differences and similarities observed in the two countries. I felt comfortable with this decision knowing that my firsthand experience will be dealt with in more detail in another publication. On Thursday we were suppose to see a throat singing band from Mongolia in the Harold Assembly Rooms, called Huun Huur Tu. I was so looking forward to seeing this as we have seen some really good world music gigs in this venue. Sadly we were informed on the Thursday morning that the concert was cancelled. I was gutted. I love going to the Howard Assembly Room, it is such an incredible venue, it’s hard to believe there are often big musicals going on in the Grand Theatre across the hall! Such a contrast. I have met some wonderful new friends by going to these kind of events. Music can really bring us together, and this was demonstrated even more as part of my healing work. The healing centre was busy on Friday and we were short of staff. I do not know where the time went as apart from a 20 minutes break, I was giving healing all afternoon. I felt confident and happy to make a difference in people’s lives, such a privilege. Last Saturday I met some students and some full healers for a few hours of healing. We listened to some healing music from across the globe followed by some time to chat and support. I felt encouraged and sustained talking to friends. We finished watching the Human Planet series, truly an amazing and a very interesting program. It has made me think though whether if we are ever able to live ethically without exploiting or harming our planet or other living creatures including humans? I will certainly live even more mindfully. We also went to see ‘The Post’ last Sunday followed by a Q and A with Granville Williams of the Campaign for Press and Broadcasting Freedom at the Hyde Park Picture House. The film highlighted important points about ‘good’ journalism including the publication of the truth and the goals of journalism, which are pertinent to today’s media obsessed world. I spent the rest of the weekend seeing some old friends, whom I haven’t seen for a very long time. I wish time and energy weren’t such big barriers in my life, preventing me from doing what I enjoy. Last week was not as busy. Earlier on in the week, I received a rejection email for an abstract I had submitted for a journal article. While I was disappointed by the rejection news, in retrospect, I was relieved to have more time for my other commitments. I attended the second session of the Women for Peace course. 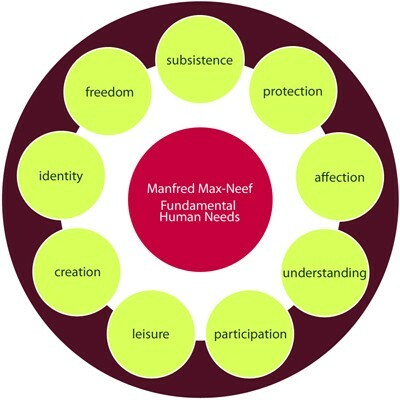 This week, we looked at Max-Neef’s Fundamental Human Needs, which explains the importance of understanding, love and affection, rest and leisure, identity, freedom, creativity, security and protection, subsistence, and participation in equal measures. According to Max-Neef conflict occurs when one or more of these are lacking. The chart was thought provoking, and while I liked the principle behind it, I did not feel these needs apply in equal measures across cultures or ages. Sat in silence, we then made assumptions about one another in pairs. Looking into each others’ eyes, while making a number of assumptions was a very uncomfortable experience for many of us, myself included. Culturally we are not conditioned to make direct eye contact for longer than a few seconds. The exercise also made us aware of the challenges associated with making assumptions based on the limited information we have of an individual. We watched Chimamanda Adichi’s Ted Talk on the Dangers of a Single Story narrative to reinforce the negative aspects of last exercise (https://www.ted.com/talks/chimamanda_adichie_the_danger_of_a_single_story). Following this, we were asked to write down words/phrases that are associated with the stereotypes of certain groups such as Irish people and refugees, and then have a discussion. This exercise brought home for me my own Single Story narrative, and the stereotypes and assumptions people make about disabled people such as unfortunate, unemployed, lazy, scrounger, useless, lonely and asexual. I thought about the damaging effects that these labels leave on me and other disabled people, and the wider implications for the society at large. 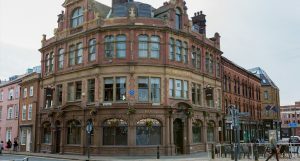 On Thursday I talked about my experiences of employing PAs for over a decade in the Employers Briefing, organised by Leeds CIL, to a group of new and potential employers. They asked questions about different stages of being an employer from recruitment to management issues. Although some of the questions were personal and trickier to answer than the other ones, I was only too happy to help as I know how valuable I would have found this kind of session myself, when I started using the Direct Payment scheme with all its overwhelming complications. Hearing the firsthand experiences of people who employ PAs would have given me clarity and confidence in my new role as an employer. On Friday I attended the Healing Centre and saw and gave healing to a new client on my own. I had an audience – two watching as students, and two full healers. Despite this, I felt confident with the process, something which I would have not found so easy a year ago. The positive feedback I received from the client gave me further encouragement, knowing that I am on the right path. I have started reading a book by Barbra Brennan called Light Emerging: The Journey of Personal Healing. I am finding its take on healing and the auric field so very fascinating. If only I was able to undertake a course in one of the Barbara Brennan Schools of Healing! I have been watching episodes from the BBC Human Planet series. It has made me wonder how complacent we in the Western modern civilisations have become, with all our comforts, when comparing our lives with the harsh realities of Inuit and native foresters, and how much we are given, for which we should be grateful and yet often are not. Comments Off on Shall we begin? 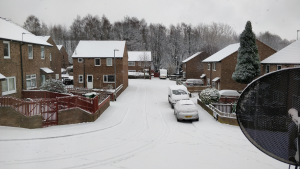 The first week of blogging was a busy one – just as well, as I am new to blogging and now have lots to write about! The week started with the first session of the ‘Women for Peace’ course. The day was a promising start to what seemed to be a very interesting course. In a group of 14 enthusiastic and friendly women, we attempted to define five key aspects of our identity. Then we tried to narrow these down to three core identities. Mine were ‘healer’, ‘disabled’ and ‘spiritual being’. I let go of ‘activist’ and ‘researcher’ parts of my identity, reasoning that by keeping the ‘disabled’ identity, I can continue challenging, informing and learning about oppression without using the labels of ‘activist’ or ‘researcher’. Following this, we thought about how these aspects of our identity relate to our beliefs and value-systems, and then how these specific values affect our everyday behaviour and attitudes. I was surprised though that neither my Iranian nor Armenian identities came to mind when choosing the five identities, considering I am a proud Armenian Iranian. Through a number of role play examples, we played out different conflict scenarios, to find out how we resolve various conflicts in a range of relationship contexts. These were then linked with Thomas-Kilman’s conflict management styles diagram. Role plays generally make me very uncomfortable but I felt comfortable enough to opt out from this activity. The group was really supportive and I felt at ease with everyone. In the end of the session, I had offers of lifts for next week, which was very reassuring and meant a lot to me. Using a taxi would have presented problems in terms of walking to and from the taxi unassisted. On the Wednesday, I attended the Disability Hub meeting organised and run by Leeds City Council. In the meeting a representative from the Royal British Legion gave a presentation about the scope of the charity and the wide range of support it offers to the service personnel, both past and present. 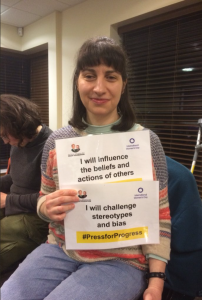 Then the project manager of Stop Hate UK talked about an event to be held later on this year with the aim of bringing organisations and people working on hate crime in Leeds together for collaboration and learning. I expressed interest in getting involved and shared my contact details. After the presentations, members had chance to share their concerns. Listening to different discrimination people face in their daily lives made me sad, no matter how much I push away my own frustration with people’s negative attitude towards me, disabled people’s oppression and struggle continue to affect us all. On Thursday I participated in the Equality Hub with another Disability Hub representative. We shared with the other members and council staff our discussions from the previous day and our hub activities. We listened to the issues raised by other hub members. I felt confident in this meeting to share with the Taxi Licensing representatives my personal difficulties I have experienced with taxi drivers, for example about intrusive questions they ask me like ‘Do you live on your own?’ or ‘What happened to you?’ referring to my impairments. He apologised on behalf of the company said that he would take my comments on board. We will see. Friday was my first healing session of the year. I felt the change of venue from the Burley Lodge Centre to the Heart in Headingley had made a significant difference, the room was much lighter and bigger with better energy flowing all round. We even had a separate waiting room. The visitor numbers also showed a great improvement. I felt happy to be back in the healing centre, giving healing again. It felt right. I spent the weekend completing and submitting an article to Journal of Higher Education Research & Development. Now that I have time and space, writing is becoming more effortless and I am feeling positive about all my writing commitments this year although I am concerned about balancing the writing with my other academic and non-academic responsibilities. I also watched a documentary on Netflix about the life of Nina Simone called ‘What Happened Miss Simone?’ The documentary revealed her personal traumas as well as featuring some of her more militant activism and of course her prodigious musical talent. Nina’s activism side and determination to fight against oppression, renewed my own commitment to fight against disablism. We also went to see ‘Darkest Hour’ directed by Joe Wright and starring Gary Oldman. The film portrayed Churchill’s character well and his emotional life when faced with dilemmas and making problematic decisions during the Second World War. This film brought home for me the difficulties of the choices we make and the importance of integrity and living from our principles. All in all an encouraging, productive and educational week. More updates to follow.